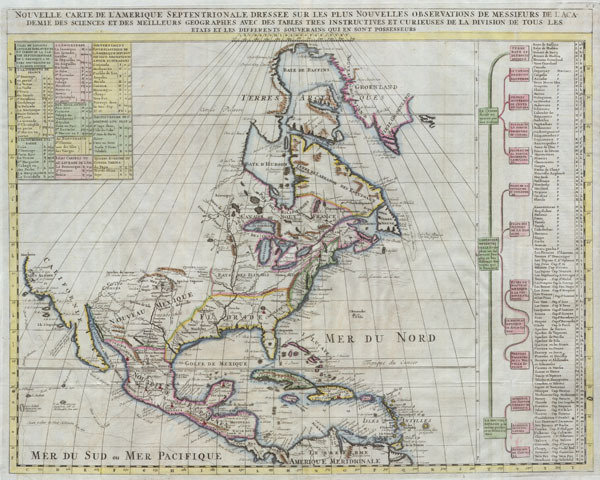 Offered here is a stunning map of North America published by Henry Chatelain for the 1720 edition of his seminal Atlas Historique. Offers some of the first well developed cartography of the Great Lakes region and considerable detail along the eastern seaboard. Indian tribes, Spanish missions, and explorer routes are all indicated with varying degrees of accuracy.Includes references to several mythical kingdoms and cities including Quivra (Quivira) just west of the Mississippi, and Cibola in New Mexico. Both Quivira and Cibola are among the 'Seven Cities of Gold' sought after by early Spanish explorers in the North America. Legend tells that the cities were founded by bishops who fled the Moorish invasion of Merida, Spain, in 1150. Although numerous explorers sought the mythical cities, including Vásquez de Coronado, they were never found.This is also one of the first 18th century maps to question the myth that California was an island. Though many claim that this map depicts California firmly attached to the mainland, a close examination of Sea of Baja, shows that Chatelain chose not to close the gulf at the northern extreme, thus leaving the 'island theory' question open. Henri Abraham Chatelain (1684 - 1743) was a Huguenot pastor of Parisian origins. He lived consecutively in Paris, St. Martins, London (c. 1710), The Hague (c. 1721) and Amsterdam (c. 1728). He is best known as a Dutch cartographer and more specifically for his cartographic contribution in the seminal seven volume Atlas Historique, published in Amsterdam between 1705 and 1720. Innovative for its time, the Atlas Historique combined fine engraving and artwork with scholarly studies of geography, history, ethnology, heraldry, and cosmography. Some scholarship suggests that the Atlas Historique was not exclusively compiled by Henri Chatelain, as is commonly believed, but rather was a family enterprise involving Henri, his father Zacharie and his brother, also Zacharie. Very good condition. Original folds as issued. Wide clean margins. Original platemark visible. Blank on verso.